By Costa Maragos Posted: July 27, 2017 6:00 a.m.
Leave it up to the creative mind of an artist to transform an everyday item into an acclaimed piece of art. Audie Murray has done just that by transforming a pair of well-worn, slightly stained sports socks into something special. Murray has received an early career boost after graduating with a Bachelor of Fine Arts from the Faculty of Media, Art, and Performance in the spring of 2017. 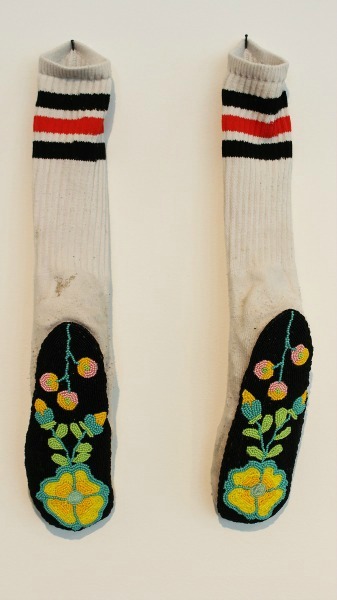 Her work “Pair of Socks” has been selected as the Saskatchewan winner of BMO 1st Art! 2017. Each year, BMO Financial Group invites deans and instructors of post-secondary institutions across Canada to nominate up to three graduating students for the competition. Murray was asked to submit one of her pieces. She chose the socks, whose soles feature colorful bead work. It won the top prize from Saskatchewan and with it $7,500. Each province and territory is represented by one winning artist. Murray’s submitted work speaks to her Métis heritage. “The Métis are known for their floral bead work. A lot of their motifs are very floral. I just gave it a more contemporary feel. I view the beads as having their own energy and personality and intervening on the object,” says Murray, whose “socks” are currently on display in a student exhibition at Art Mur in Montreal this summer. Murray grew up in Regina where she graduated from Thom Collegiate. She learned bead work while enrolled in the Saskatchewan Urban Native Teacher Education Program at the University of Regina. 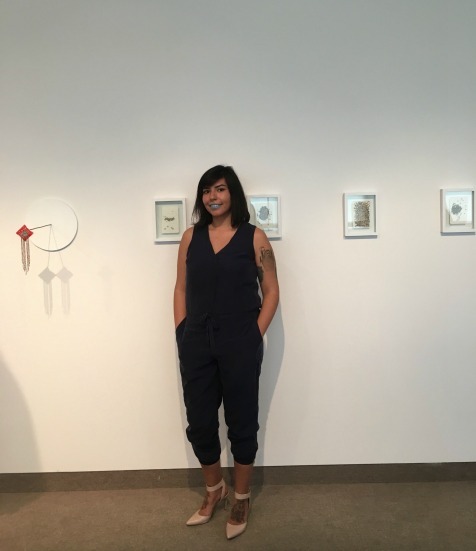 After two years in that program, she moved to Camosun College in Victoria, B.C., before transferring to the University of Regina to complete her BFA. “Being at the U of R was a good experience. I really appreciated having my own studio space. It was helpful in making a lot of my work and having the feedback of staff and my peers,” says Murray. As for the BMO 1st Art! 2017 recognition, all the winning art pieces will be on display later this year at the Justina M. Barnicke Gallery at the University of Toronto and will be featured in the fall edition of Canadian Art magazine. In addition to the prize money, BMO has invited Murray and the other winning artists to Toronto for a special reception in November. It’s a strong start for a young artist, and it’s thanks to a pair of used socks and a creative mind.